I moved to Atlanta with my family in 2013. Everything was new. And like anyone who has moved to a new city, it was a challenge to find the best services & professionals that you only need every once in a while. 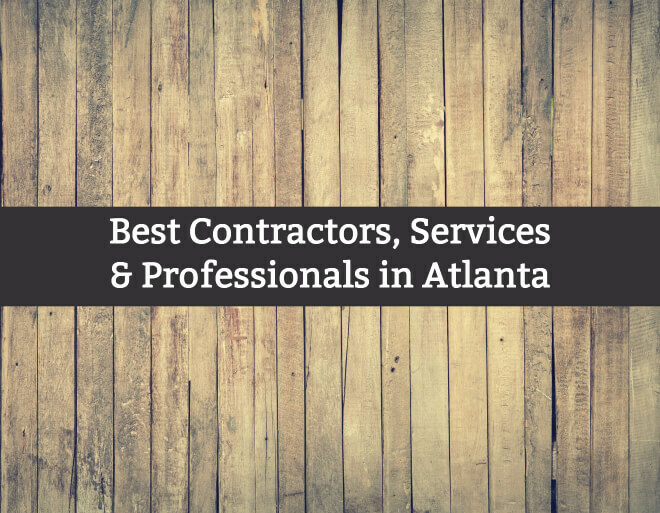 We’re still in the market for some services, but here’s the list of professionals, contractors and solid businesses that we’ve found so far. We bought a home in Grant Park in 2013. Atlanta’s real estate market is pretty crazy, but these people helped us navigate everything. We found Christian via a referral from our real estate agent in Athens, GA (Bob Allen). She found us the right house in a super-tight market. I’d recommend her to anyone looking for a home. The seller of our home required us to use Ray. Needless to say, we were very skeptical. But Ray won us over with his attention to detail and professional work. I run a small business – and have a family. For any big life decisions, I talk to these people. We found Larry via Christian Ross. He helped close our home sale. But we went back to him for our family and business legal work. Like every lawyer I’ve ever met – he’s fast and to the point. But he’s good and I recommend him to anyone. See Raimondi & Associates’ website. Dr. Cash has long and impressive accounting resume. He’s been running his own firm for several years. He’s a longtime friend of my family, and has been invaluable to my business. He is technically in Athens, GA – but well worth the drive / phone call. I am a big fan of using a locally headquartered bank. I was with SunTrust for a while until they merged with BB&T and moved to Charlotte. I moved all my banking to Delta Community, and wish I’d have moved sooner. They don’t have the fancy graphic design of a big bank, but wow, their customer service and functionality as a bank is so good. Learn about Delta Community Credit Union’s accounts here. Anyone who owns property knows all the random things that come up both regularly and irregularly. Here’s the people that help me out. Mark works exclusively in neighborhoods around Reynoldstown / Grant Park. He does everything in a house that does not require a professional license. He’s ridiculously fast & effective. He’s affordable and does high quality work. I found Ayinde via NextDoor when our 2nd year fescue lawn needed aerating. He’s ended up doing regular lawn & yard work in addition to several landscape projects like our front patio. Skyline did our original termite warranty. They now our our regular pest control. They’ve also done a wildlife exclusion. They’re on-time and reliable. Thankfully, we haven’t had many plumbing problems. But both times, we’ve called Marty. He’s honest and fair. Thankfully, we haven’t had any electrical problems. But we have made a couple changes that Mark Harrelson hasn’t been able to do. In those cases, we have called Percy Hampton. He’s incredible. Not cheap – but also the best electrician I’ve ever worked with. We had our house weatherized and sealed up. It was one of the best investments we’ve ever made in our house. We called Harden to do the work (including the Georgia Power rebate application). Great experience. We had issues with our trees after Hurricane Irma. Atlanta Arbor was fast and professional. Hugo is a local Grant Park HVAC specialist. He’s smart, straightforward, and very reasonable given the extra level of service we got. Call or Text him at 770 906 1965. Donald re-painted the interior of our house, and repaired several sections of drywall. He does great work. He’s quick and straightforward and forthright with expectations. Call or text at 678 779 3211. I get around Atlanta via bus, train, bike, car and foot. But it’s my car and bike that need occasional work. Here’s who I go to. Whenever we’ve needed any non-engine car repair, we’ve always called EZ Dent Repair first. They are based in Athens, GA. But totally worth the drive. The owner is a long-time friend and client of mine. See EZ Dent Repair’s website. Also check out their hail damage services. We’ve needed larger scale body work twice (after a collision incident and after Irma). Both times, the dealer body shops quoted extortionate prices at absurd time frames. We took our car to Mark both times. He does not have the nicest facilities – but he does great work at a great price. He’s honest and fair – which is rare in the car body repair world. We still haven’t found an independent car engine repair shop. However, Tires Plus has always taken care of our cars for cheaper than the dealer. They are decently fast and up front. I’ve used several bike repair shops in Atlanta. But Atlanta Bicycle Barn is the only place that I’ve gone back to. I also bought a bike from them. See Atlanta Bicycle Barn’s website. Doctors. Health insurance makes this a bit frustrating, but these are the people that I trust when I can. Southern Smiles is our neighborhood dentist. They’ve been great. Our son has been going here since we moved to Atlanta, and we’ve stayed with them because he likes them so much. I’ve been to Dr. Shirey as my GP. Great experience. See Rossi & Shirey’s website. We researched so many pediatricians when we moved up here. Even when we were living in Buckhead, we drove to see Intown Pediatrics. Their whole staff is amazing. There are plenty of people that help me regularly. This section is sparse, but I’ll add to it when possible. I tried so many haircutteries in Atlanta before I found David at Axiom Cutler. They are reasonably priced, but also fast and great.